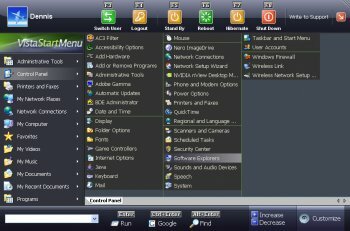 Vista Start Menu is a convenient alternative to the Start menu. It is much easier to find and run the program you need. Everything is visual and extremely easy to use. Your applications are arranged in a table with icons divided into groups, which makes it easier to work with a lot of programs. i highly recommend this program to vista users. it is disturbing to not understand why if vista is such a graphical exhibition, it has a poorly looking and limited start menu. perhaps, microsoft should buy this program and provide is as a vista extra as it is a worthy addition to vista and very helpful for vista users. The new version 3 is nice. Needs more skins though. There are only three or four functions that aren't in the free version so I am revising my score. for the great work he has done is creating the way this thing presents your programs and Start menu. This should be the Start menu in Windows 7. The videos and web site design are top notch professional work as well. Come on people give the guy a break he has really spend a lot of time not only programming this thing but more importantly a huge amount of time planning and thinking it through as well. Actually a stable and useful program. I have no issues with the white letters on a dark background, not at all difficult to read. Improves the usefulness of Vista, which is saying a lot. Vista will one day be consigned to the garbage pail of history, but for now we have to make it as painless as possible. Bad program. I deleted it after 10 minutes. White text on lightgrey background. Hard to see. Access violation at several occasions! Like the looks, and the layout. I don't like the fact that it's so limit. Still a good program. I don't like navigating the startmenu. So this program is a big upgrade to the current startmenu. Vista's start menu while compact seemed difficult to navigate and locate the programs wanted. also I had to struggle to locate my old standby's like run. I have an acer laptop that inconveniently seems to shut off wireless internet connectivity. This ap makes trouble shooting much easier. the vista start menu is supposed to be compact... thats the only good thing about vista! and ur doin this program to EXPAND it again?!! I just bought the Pro Version and I just love it. You get a full sized menu with no scroll bar and you can adjust the icon size so you can actually see what you are looking for. The start menu window is expandable and it works right off the Vista start menu standard task bar icon or keyboard Start key. 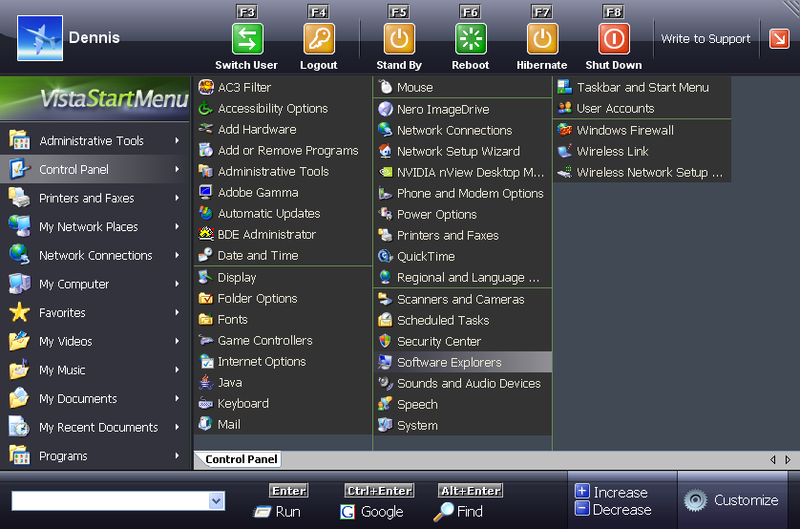 If you were disappointed with the teeny start menu that came with Vista, this is a great solution. Thumbs up. No registry issues or other issues for that matter. Love the UI, and the way it lays everything out. I would have to agree, it's pointless with out the full bore version. Aside all that it's a great program. Appreciate the work done on this but without the pro features it is pretty useless. Yea well, Roxip XStart uses 24M of resident memory, and Vista Start Menu has been very stable for me. Also, this is an attractive app — you can toggle the size and customize the look throughout. The best thing is that it tweaks the crud out of Vista's ill-conceived start menu. This app has matured nicely. I'm using v.2.2 (Pro) and it is refined, very easy to use, and does what it says it will. It's developer, Dennis Nazarenko, is very approachable and open to both suggestions and criticisms. I've watched this evolve from 1.4 through the current version and the strides made have been huge. For those of you reading the comments relating to v.1.4, please note that the differences between 1.x and 2 are profound.